Starting tonight, South End has a new iconic sight. 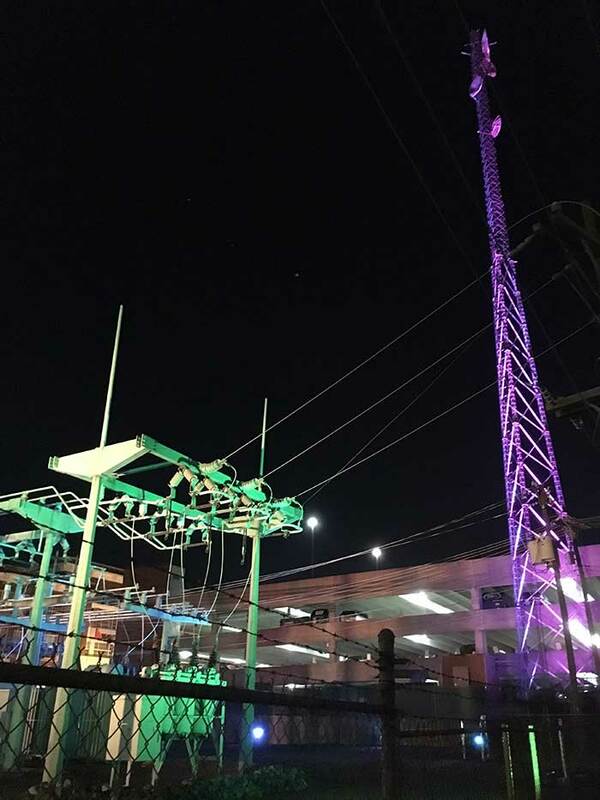 The Duke Energy substation and neighboring radio tower along the Charlotte Trail Trail will now be lit by the same type of lights that mark the Duke Energy Center. The substation is along the Rail Trail right by Bland Station, behind the Charlotte Trolley Powerhouse Museum. Turning the ugly mess of metal and wire into more of an attraction has been a part of the public discussion for more than two years — and it’s now actually happening. 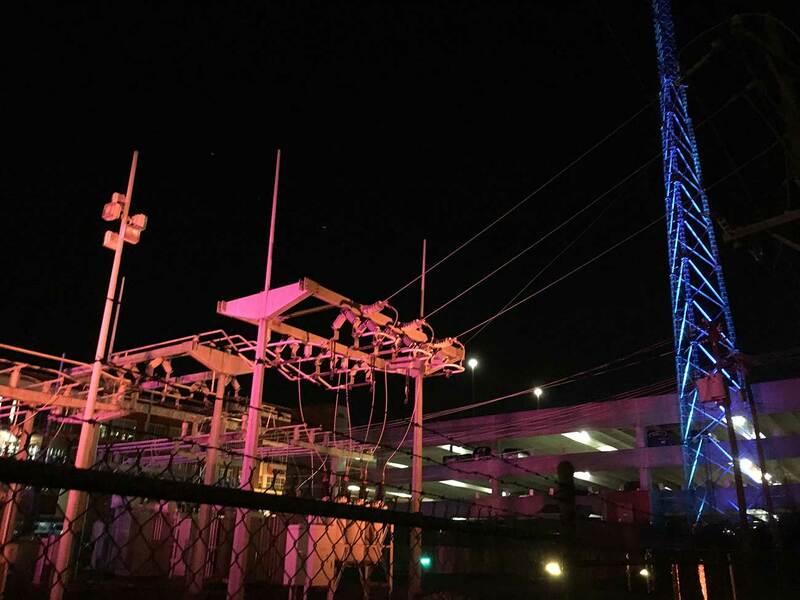 The lights will be on from dusk to 11 p.m. and from 5 a.m. to 7 a.m. They’ll be programmed in different colors to highlight particular events — a Panthers Super Bowl appearance, for example — just like the Duke Energy Center. This display is almost certainly going to become one of those Charlotte sites that distinguishes the city on national television and professional photography. And it also marks a big step forward for the Rail Trail. Charlotte Center City Partners will unveil the light display tonight (Wednesday 1/27) at 6:30 p.m. They’ll also be showing off a new logo and T-shirt design — made by 704 Shop — that they hope will give new momentum behind the Rail Trail. The light display is the first big development in the 4.5-mile Rail Trail that runs alongside the LYNX Blue Line south from Uptown. 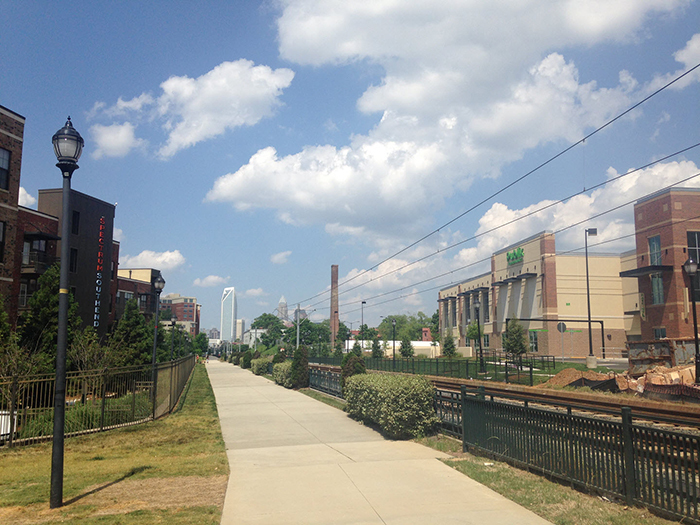 The pathway connects much of the booming development in South End, and creates a path into the Center City from neighborhoods including Sedgefield and Dilworth. 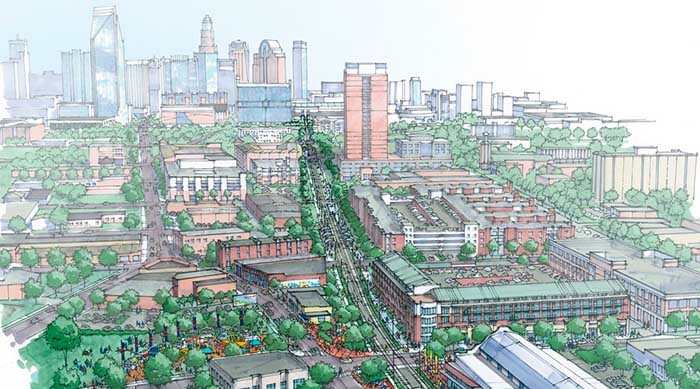 The idea is to turn all the leftover space along the light rail line and use it to turn them into something that makes Charlotte a more interesting place to live in. Most of it looks like a standard sidewalk today. The ultimate goal is to turn it into a continuous public park. The trail received a $412,000 grant in 2014 from ArtPlace America to help make that a reality. The idea is to create pocket parks, art installations, plazas and fun things like permanent ping pong tables spread out across the length of the trail. Down the line, Center City Partners also wants to have food and drink vendors there too. The Center City Partners vision for the “linear park,” as they call it, is extraordinarily ambitious. It begins with a “Terminus Park” at the bottom end of the trail, by New Bern Station and continues with things like a skate park by the Publix and Sycamore Brewing, an outdoor seating area and plaza by Price’s Chicken Coop, and so on up to First Ward Park. But you’re already starting to see some progress. 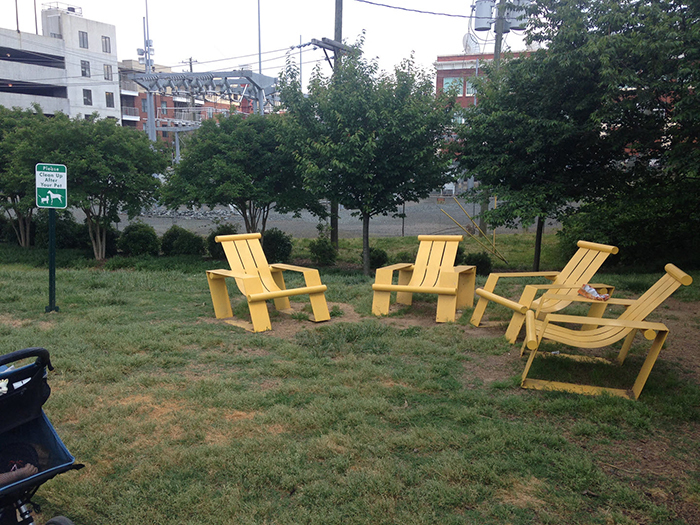 Take the “Before I Die” chalkboard, the rooster sculpture, and these chairs near the Duke Energy substation. 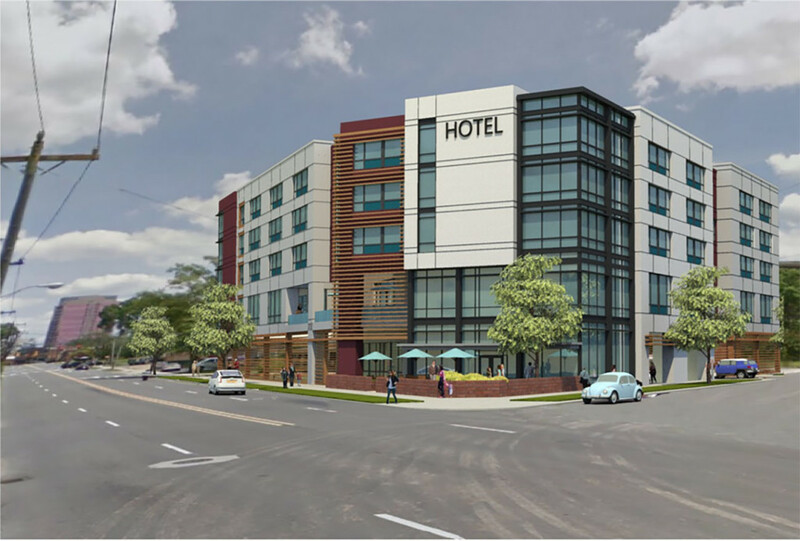 Center City Partners says to expect another one to two major developments in 2016. Developers are also pledging improvements along the rail trail as they get city approval for new projects along the light rail line — the Lennar project at the Pepsi Bottling plant facility will likely do some work on the trail, for example.